Who wouldn’t like to bake pizza at home, grill kebabs, or toast some bread for breakfast without the hassle of heating up and cleaning a large oven? Then toaster ovens are your best choice. Toaster ovens don’t cost much money either. Most cost around $100. If you want a larger toaster oven, you can pay up to $300. But if you want a compact and energy efficient toaster oven, a budget of $100 is very sufficient. This is a neat little toaster oven that not only makes toasts, but also bakes cookies, breads, and even pizza without a hassle. This is very much a miniature oven that is more energy efficient than a regular oven, but is more versatile than a toaster. This toaster oven uses convection heating, warm air will be circulated throughout the oven with the help of a fan. The advantage is that it bakes real fast. this toaster oven can get quite heated, so make sure not to place any plastics or melt-y items anywhere near this appliance. You will have to follow this rule with any toaster oven. The oven has very convenient two rack positions. It’s easy to cook breakfast or dinner for a large family in less than an hour. Also, you can bake a pizza on the top rack and broil kebabs in the lower one with ease. At one time, it can cook a 12-inch pizza and 6 slices of bread. This oven comes with easy and modern digital controlling and a 120 minute timer. The text that accompanies the buttons is very small and can fade quickly if you are not careful. We really liked the crumb tray on the bottom that can be removed for cleaning. 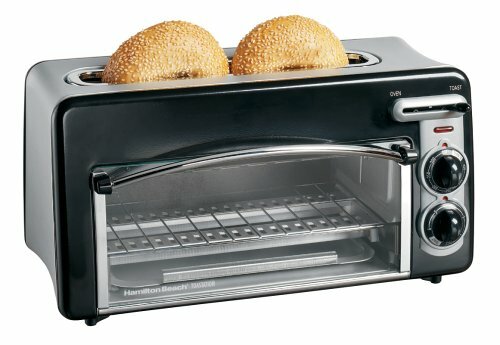 This is a unique toaster oven. Actually, we would call it a toaster with a mini oven part at the bottom. The top toaster can toast 2 slices of bread or bagel at a time. Then bottom part is a mini oven that can cook meats and pizza in small portions. We managed to bake 2 medium sized pizza slices at once. Overall, this unit is really small and compact. So if you live in a dorm or an apartment with limited kitchen space, then this toaster oven would be ideal. It’s not as large and accommodating as most toaster ovens. However, it can offer a lot more than a toaster for smaller kitchens. This toaster oven is completely electric, so it works quietly without a fan. It has automatic shut off and a slide function lever. It wonderfully comes with a crumb tray at the bottom for easy cleaning. Though small, it can still bake cookies, small cuts of meat, kebabs, and the like. Overall, this is an excellent product for the budget price. Making crispy toast or perfectly broiled chicken slices has never been easier. This Hamilton Beach 31401 offers a number of features that busy people can truly appreciate. This toaster oven can bake and broil. The latter is a rare feature for toaster ovens, so you can definitely benefit more with this product. You don’t have to preheat this toaster oven. Preheating can waste a lot of energy, which you can completely avoid with this model. This toaster oven uses less energy to deliver the same results as other toaster ovens. For example, you can reheat frozen chicken nuggets using only 75 percent less energy than other ovens. And you can cook the nuggets 20 percent faster, according to the brand! This little toaster oven is also highly versatile. You can make toast, bake pizzas, broil chicken, and cook frozen dinners without wasting time. You can bake, broil, and toast using only three different settings. Shove in even a casserole and it will cook. The toaster oven is compact, but you can shove in a 9-inch pizza inside. Cook time for bigger meals is as quick as 30 minutes. The exact size of the toaster oven is 15 x 11.5 x 8.7 inches. The oven comes with its own bake pan. The toaster oven has auto shutoff for extra safety. The exterior is stainless steel so cleaning is easy. It’s almost perfect. If there’s a downside, then it’s the slightly off temperature settings. Don’t expect exact temperature readings. This, however, is not a major issue when you want to prepare a snack or a small meal. 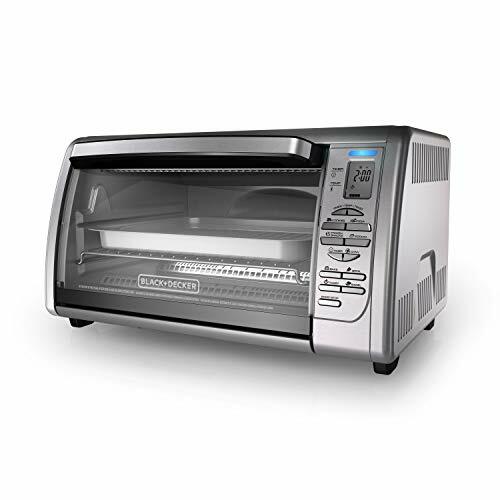 The SpaceMaker toaster oven from Black+Decker is as good as they come. As the name suggests, this toaster oven is designed compact to save space on your kitchen countertops! It can be mounted onto a wall or a kitchen cabinet. Mounting definitely frees up a lot of counter space and will make your kitchen look and feel bigger. The space saving is not the only major feature of this toaster oven. Unlike the compact exterior, the interior of this toaster oven is significantly large and deep. Cook a 9-inch pizza or toast 4 slices of bread inside the oven. There is plenty of space to cook up snacks in a hurry. 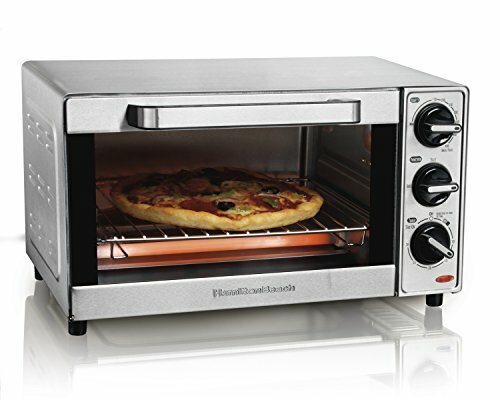 This is another impressive mini oven that not only toasts, but also bakes and broils. You get up to 7 toast settings. The temperature of this toaster oven can reach up to 400°F. It’s great for baking just about anything that fits inside. The unit comes with a crumb tray. The drop-down feature makes it really easy to open and clean. The installation is kind of a nightmare. The installation kit doesn’t include enough spacers or drill bits to securely attach this to a wall or an oven. Other than that, this product is solid. 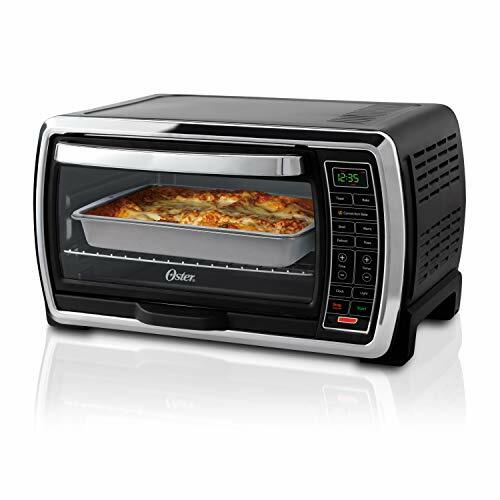 This Oster is a wonderful combination of a convection and a toaster oven. It offers the functionality of the former and the convenience of the latter. The large capacity size. The interior is big enough to accommodate a 12-inch pizza! The interior is so well designed, it even has a light. You can always check what’s inside even at night when the overhead kitchen lights don’t show you inside. It’s not only toast you can make with this. Pop in casseroles, roasts, or frozen dinners for a quick meal on busy days. The exterior size of this toaster oven is 19.72 x 16.29 x 11.33 inches. So you might need a bit more counter space than usual to place this. You can expect a wide temperature range between 150 to 450 degrees. In this sense, it’s not much unlike a regular oven. This toaster oven heats up fast. You won’t have to bother with preheating and the meals cook relatively fast. Do beware that the unit can get hot quickly. Exercise caution when handling this toaster oven. The unit comes with a really good baking pan. A removable crumb tray is included to make it easier to keep the oven clean. A $100 is a great budget to buy a really good quality toaster oven that will last in your kitchen for years. Always mind the size of the interior. If you plan on baking large pizzas, make sure the interior can accommodate it. Toaster ovens of this budget range can at most fit a 12-inch pizza. Decide between a convectional toaster oven and a completely electrical one. 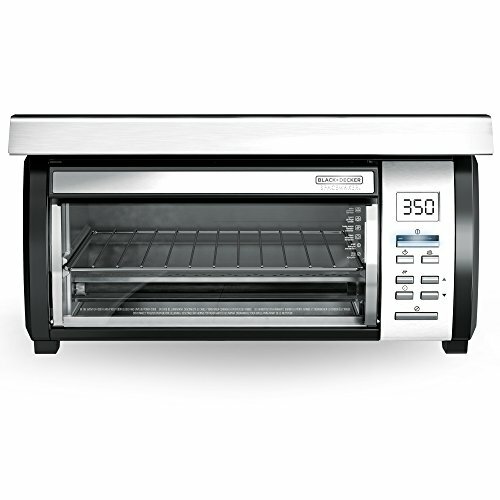 Convectional toaster ovens have fans inside to distribute heat. These ovens bake faster in general, but can be a bit noisy too. Electrical toaster ovens are less energy efficient, but are completely noise free. If you want an easy to clean toaster oven, look for a product with a nonstick interior. Some toaster ovens have crumb trays included, so little foot items don’t gather at the bottom. You can easily slide out the crumb tray and cleaning without sticking your hand in the oven. Buy a toaster oven with auto shut off. It will prevent your food from overcooking, and also will reduce the risk for fire hazards. The toaster ovens mentioned above have auto shutoff features. Do pay attention to the controls. They should be intuitive and easy to use even for someone who is not at all tech savvy.